Kuniaki Sakagami was born in the city of Toyohashi, Japan, in 1944. He started training in Wado-Ryu Karate in May 1959 aged 14, Under Mr T.Suzuki at the Toyohashi Dojo. After graduating from the local high school he entered Aichi University to study economics. 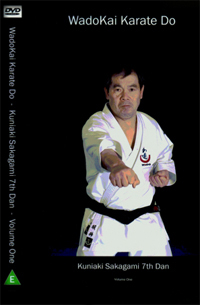 During this period Sensei Sakagami entered many universities and all styles contests. He won the University of Tokai area championships and the Tokai arena of all styles championships in 1965 and 1966, Receiving the placing In the all styles University championships of Japan. This culminated in Sensei Sakagami being honoured with the position of University Karate club captain, A prestigious position that is only held by the most talented of Karate Ka. 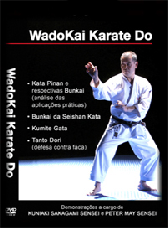 Sakagami Sensei was awarded 7th Dan in 1989 from Wado-Ryu headquarters in Japan. Ayumi Ashi, Okuri Ashi, Tsugi Ashi, Surikomi Ashi, Yori Ashi. In addition there is rare archive footage of Sakagami. 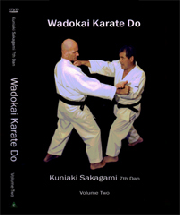 Sensei Sakagami demonstrates the remaining 9 Kata of Wadokai not shown in volume 1. In addition all 10 Kihon Gumite unique to Wadokai are demonstrated explained in detail. This DVD is filmed in a recording studio using state of the art technology. UK £3.00 for 1 DVD, £4.00 for 2 DVD's or £5.00 for all 3 DVD's.